In my latest book I've tried to create a very quick and brief sales training course on how you can create a 5 stage appointment call. The book is called Making Sales Appointments in a Nutshell. Training on making sales appointment calls in a nutshell. The training is for people who want a quick and simple way to create a telephone script that will get them results. You will introduce you and your company using brief information that helps the prospect to quickly build a picture of who you are, and what your business does. You’ll then add a reason for calling that has potential benefits for the prospect and that will give them a reason to keep listening. After just a few lines of this very short introduction your prospect will know who you are, what you do, and why you’re calling. The Motivator is a technique that I developed while working with sales people that made their own calls to make appointments with potential customers. Using this one line you join together the Introduction stage and the Questioning Stage forming a seamless connection that keeps the conversation moving forward and prevents objections. Here we create a structured questioning process that gives you all the information you need to qualify the prospect as a potential customer that is worth meeting. Early in the call you will know whether the prospect can actually buy from you, and whether it is worthwhile continuing the call. The information you gather here will be what you need to know to qualify the prospect, and what you want to know to be able to prepare for the meeting with them. Because of all the work you have done in the early part of the call you will be able to gain agreement to a meeting with the prospect by making a simple proposal. The training shows you how to create a question that is specific to your prospects, and also makes meeting with you the logical next step in the process for them. Most real objections arise as you try to gain agreement to a meeting in stage 4, but they can arise at any stage throughout the call. The techniques you will learn will equip you to deal with objections and concerns in a unique way. Instead of arguing with the prospect and contradicting them, you’ll learn how to go around the objections and keep on course towards your objective of gaining agreement to a meeting. There are also some proven techniques at this stage on preventing objections and obstacles by pre-empting them. 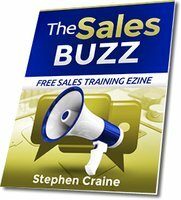 Want to leave a comment on this issue of the Sales Buzz. Tell us what you think, and add your techniques and ideas on the same topic.